Two-factor authentication — there are so many different solutions, authentication methods, integration issues, and new security concerns cropping up in the market. With such a large diversity of vendors, it's easy for IT security decision-makers to get confused about which solution is right for their organization. 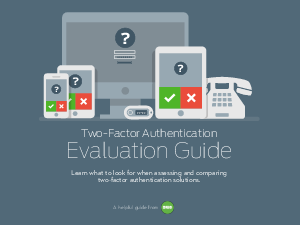 This guide walks through some of the key areas of differentiation between two-factor authentication solutions and provides some concrete criteria for evaluating technologies and vendors. How to evaluate the security, reliability and scalability of a two-factor solution. What kind of solution allows you to detect and react to potential threats. How to determine the time and costs involved in rolling out a two-factor solution. Key criteria to drive user adoption and increase productivity. And more! Download our free guide today for a deep-dive into evaluating a modern two-factor authentication solution that can meet your organization's security needs.